Biofinity lenses are soft contact lenses designed out of a unique hydrophilic material that is advertised as being 'water loving'. Biofinity lenses are aimed at patients who require a comfortable wearing experience. 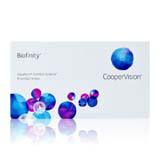 The BIOFINITY brand is managed by Coopervision, the third largest makers of contact lens solutions in the world. Biofinity contact lenses feature many of the company's advanced features including its Aquaform technology. High Oxygen Transmissibility: Each of the lenses within the Biofinity 6 pack is manufactured out of a unique ingredient that allows a great percentage of available oxygen to reach the eye. This results in healthy, white and clean eyes. The high oxygen permeability also delivers a more comfortable user experience. Comfortable Handling; Users will have little difficulty handling and inserting the lens into their eye. Biofinity lenses are built with rounded edges which optimises their comfort all though the day. Hydration: The Biofinity 6 pack features the company's patented Aquaform technology which delivers a constantly moist environment to the user. The lenses remain hydrated during the day regardless of what they are used for. The surface of the lens is also resistant to the formation of protein deposits which can cause irritations or allergies. AQUAFORM: Developed by CooperVision, AQUAFORM technology enhances the comfort factor of the lens. It increases the wetness of the lens by creating hydrogen bonds with the water molecules. The keeps the lens soft and wet even when it is worn for extended lengths. The wetness and hydrogen bonds caused by AQUAFORM also increases the lens resistance to protein deposits. Biofinity lenses are ideal for people suffering from ocular issues who prefer the convenience of contact lenses over glasses. They offer a more convenient and attractive option. They are suitable for people who live active lifestyles. The comfortable fit and design of the lens makes it an alternative for athletes, workers or people who live an active lifestyle. Can be used in situations where excellent peripheral vision is needed such as driving. Each pack is accompanied by 6 lenses within the box which can be used daily over the course of a month. The lenses should NOT be used beyond this period. It is important that people only use their contact lenses as instructed. Wearing contact lenses wrongly can lead to an eye infection or an ocular or vision problem. The Biofinity 6 pack can easily be ordered online from dozens of retailers. Patients can also find cheap or affordable alternative by shopping at online stores that are recognised by private funds. Contact Lenses Online is home to a wide range of ocular solutions including the Biofinity 6 pack. Patients can buy their lenses and use the issued recipients in securing rebates from over 30 different Australian private finds. Known history of allergic reaction to the contact lens. This may be caused by the active ingredients within the cleaning solution or the lens. The presence of bacterial, viral or fungal corneal infection. With gentle rounded edges and ground breaking technologies behind its design, the lenses within the BIOFINITY 6 pack are suitable options for most people whose prescription falls within the available range. The BIOFINITY 6 pack can be ordered online. The lenses can be used to correct some ocular conditions. As a result of this, it is strongly advised that people refrain from buying their lenses using outdated prescriptions.